A postcard depicting the Ramon's, located at the corner of Atlantic Avenue and Florida State Road A1A (SR A1A) in Cocoa Beach, Florida. Ramon's was established by Donald Holt and Allene D. Holt (d. 2013) when they migrated to Cocoa Beach in 1956. 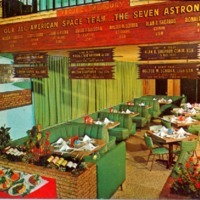 The restaurant honored the Mercury Seven, who were the seven astronauts to pilot Project Mercury's manned spaceflights. Also called the Original Seven and Astronaut Group 1, the group included Scott Carpenter (1925-2013), Gordon Cooper (1927-2004), John Glenn (b. 1921), Gus Grissom (1926-1967), Wally Schirra (1923-2007), Alan Shepard (1923-1998), and Deke Slayton (1924-1993). In 1975, the Holts sold their restaurant, which has since been replaced by a strip mall. Original 9 x 14 centimeter color photographic postcard: Private Collection of Bob Van Horn. Digital reproduction of original 9 x 14 centimeter color photographic postcard. Cocoa Beach Collection, Brevard County Collection, RICHES of Central Florida. Originally published by Action Color Productions. Copyright to this resource is held by Bob Van Horn and is provided here by RICHES of Central Florida for educational purposes only. "​Famous in its day: Wolfie’s." Restaurant-ing Through History. https://restaurant-ingthroughhistory.com/2011/03/27/famous-in-its-day-wolfies/. Al Shepard; Alan Bartlett Shepard, Jr.; Alan Shepard; Astronaut Group 1; astronauts; Cocoa Beach; Deke Slayton; Donald Kent Slayton; Gordo Cooper; Gordon Cooper; Gus Grissom; John Glenn; John Herschel Glenn, Jr.; Leroy Gordon "Cooper, Jr.; Malcolm Scott Carpenter; Mercury 7; Mercury Seven; Original 7; Original Seven; outer space; Ramon's; restaurants; Scott Carpenter; space exploration; Surveyor I; Virgil Ivan Grissom; Wally Schirra; Walter Marty Schirra, Jr.
“Ramon's Postcard.” RICHES of Central Florida accessed April 24, 2019, https://richesmi.cah.ucf.edu/omeka/items/show/7556.